For those of you who are new, or maybe just never caught it, last August I did a post about my new Insta-Life album that I started making from all of my 2012 photo-a-day pictures that I took on Instagram. I won't rehash it too much, but for me, iPhone photography has become practically the only way that I take daily photos anymore. Yes, I love my fancy DSLR, always will, but the convenience and ability to capture a special, maybe even once-in-a-lifetime moment with my iPhone camera (that I always have on hand), is something that I will forever be grateful for. Taking photos of everyday moments that I want to remember has become almost habit for me... which I love. Documenting my sweet girls practicing spelling words, snapping a picture of my kids walking home from school or getting the perfect shot of a beautiful sunset, are all precious things that I don't ever want to forget. That being said, I'm sure you can image how many pictures I have... it's embarrassing. But last year, I promised to get those great pictures OUT of my phone and computer and INTO some sort of memory keeping journal, so that my kids and husband could enjoy these precious memories just as much as I do. 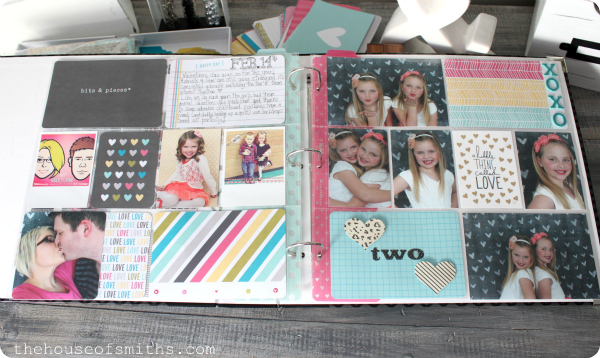 Let's get real, most days, I've barely got time to comb my hair, so the idea of scrapbooking the way I would want to do it, has always seemed far fetched. An Insta-update from 2 days ago... just keepin' it real. This is why I'm SO SO SO grateful for Project Life. 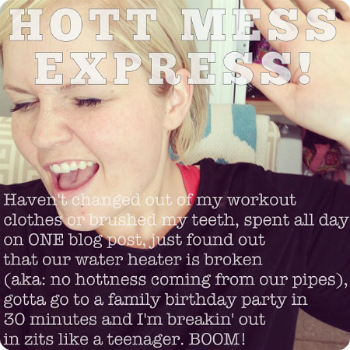 I know I sound like a broken record to some of you, but I get questions asked ALL the time about Instagram journaling and general picture scrapbooking (being a blogger who takes a trillion photos)... so I just have to keep sharing and reiterating what REALLY works for ME, in MY crazy life! I'm sure most of you already know how the Project Life products work, but if you don't, here's the quickest rundown ever. Album + Cute Papers + Photo Sleeves + Pictures + Pen = Done and DONE! The best part, is that YOU only provide the photos! Yeah, I know, overwhelming huh? Well guess what? You can officially breathe easy, because I'm about to take all of your scrabooking stresses away, with these two simple answers. There is NO WAY that I have the time, at this point in my life, to go back 5, 6, 7 years ago to when my girls were first born and start documenting everything from that moment forward. More than likely, I'd give up about the first week in. There's just too much to say, to document and to remember! So my solution is to just start NOW. Don't let today's moments be forgotten like the ones in the past. Print even just a few pictures from the last month or two and journal them ASAP!!! 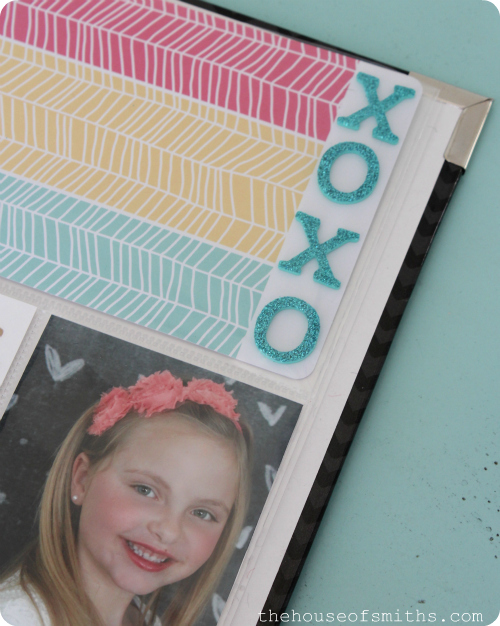 Don't get me wrong, embellishments are TOTALLY my thing (that's why I love smash booking... more on that in another post) but for the sole purpose of getting a grouping of our pictures into an album, so that we can actually enjoy them... Project Life is perfect. 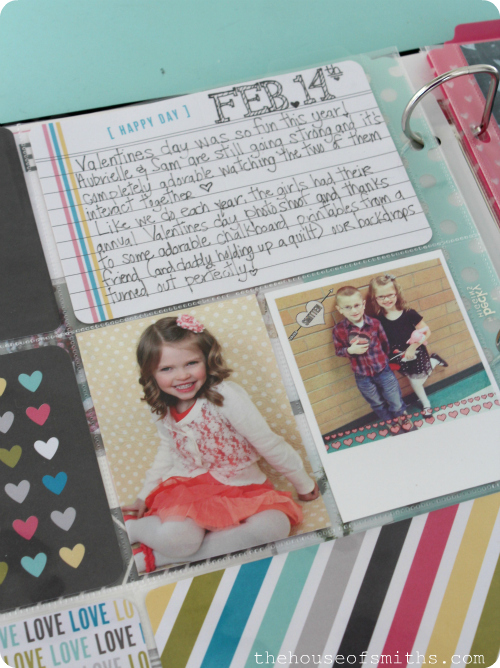 To finish these two pages all I added to my already cute Project Life cards and photos, were some decorative scrapbooking letters, 2 cut out hearts and a tiny bit of journaling; that's it! Assembly took all of 10 minutes... no lie. If you want to begin the process/habit of journaling your personal photos, but don't know where to start or feel like it's all just too expensive... you're in luck. 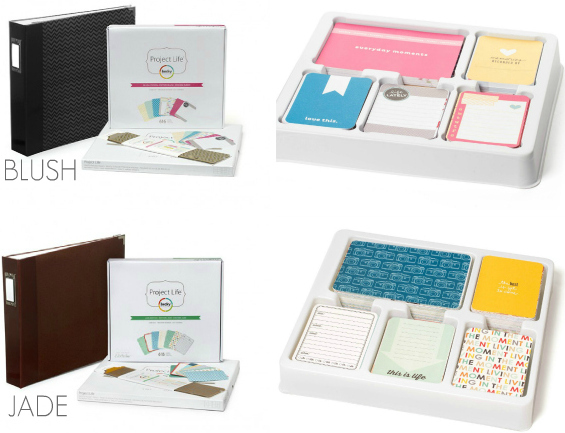 The WHOLE reason that I'm blabbing on and on about this amazing product, is because I'm silly-excited to share with you that on Monday, March 25th, Project Life will be making their TV debut on HSN, where they'll be selling two full Project Life kits that include an album, page protectors and either a Blush or Jade edition core kit!!! This specific sale is value-priced and you won't be able to purchase Project Life for this amount anywhere else, so I wanted you guys to know about it, here, first! 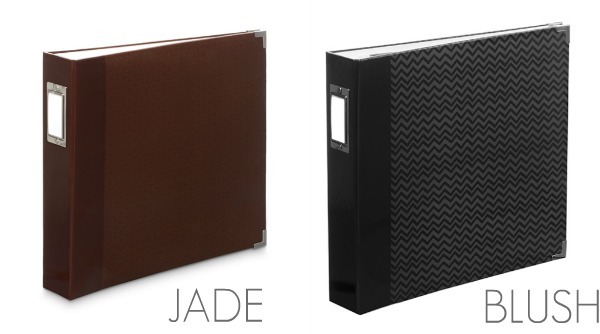 In my photos above I am using the BLUSH edition, but the JADE is equally as awesome. Here's a more detailed closeup of a few items that each kit will come with (minus the page protectors). Nobody will know the exact price of these kits, until the HSN sale is live, but I'm already anxiously waiting, because I think these would be AWESOME Christmas gifts for a few family members and one or two friends that I can think of right now. So make sure you jump on this fantastic deal while it's going, on the 25th, and get moving on journaling those precious pictures you have of your kids, family, pets... whatever it may be! 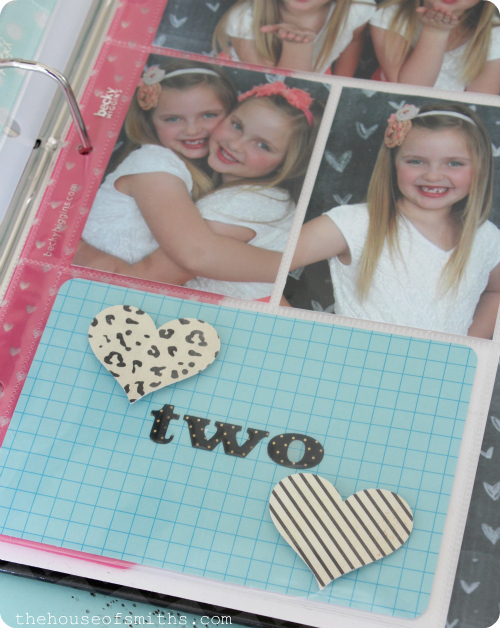 It really IS easier than you think, and the perfect way to make "scrapbooking" work for YOU! Ok, sold. I'm going to try it. I work Monday, so do you know can you purchase it online from HSN? I have a years worth of photo a day challenge just chillin' in my computer and phone. Really I need to release the memories! You will be able to order online Monday only, according to Becky's site. YES, TUNE IN ONLINE. THEY'LL HAVE THE SAME DEAL. Yes! Tune in online and check out all the great stuff! 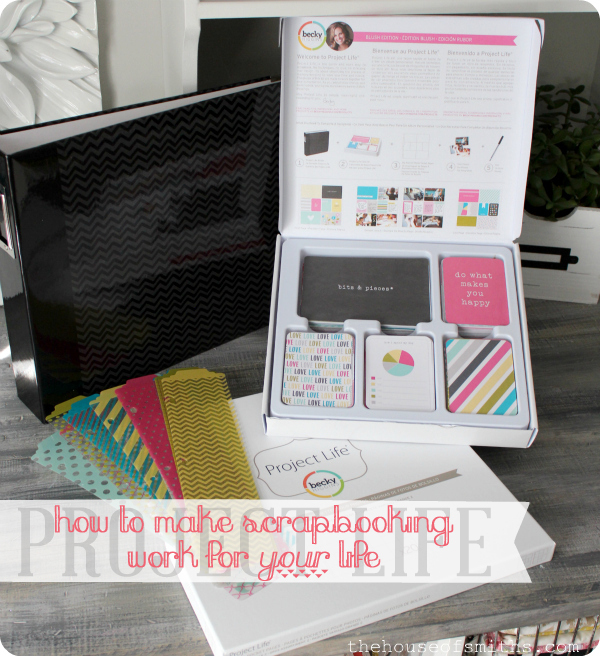 I would like to make an instagram scrapbook / album as well and have taken time to look into the Project Life products. BUT . . . they don't have sleeves that perfectly fit square Instagram photos (a nice 12x12 sleeve that fits 9 - 4x4 photos would be perfect). I don't want to have to cut down those cute square photos, nor do I want to have to add a 2 inch piece of paper to EVERY photo just to make up the difference in a 4x6 photo sleeve. So what's a girl to do??! :-) Please help!! L makes 4x12 sleeves that fit 3 (or 6 total) 4x4 pics. We R Memory Keepers makes the 12x12 sleeves you describe: http://www.amazon.com/Protectors-12-Inch-12-Inch-10-Pack-4-Inch/dp/B002V3CPMA/ref=pd_sim_hg_7 that will fit ito PL albums. Lindsay! They do make instagram pocket pages! There's quite a few out there on Amazon too in different layouts! If you're looking for 4x4 photos, try Mpix or Persnickety! They actually just came out with page protectors that have squares! I think you can see one in this link: http://www.amazon.com/Sleeve-Protectors-12-Inch---12-Inch-10-Pack/dp/B002V38IBW/ref=sr_1_11?ie=UTF8&qid=1363881871&sr=8-11&keywords=project+life I don't *think* they will be included in the HSN deal, but you could purchase them separately on Amazon. Not sure if you've found this out yet, but Project Life DOES have Instagram photo pocket pages! They're style I and J. Go to amazon.com and search for Project Life Instagram and you'll see them there. Hey Shelley, thanks again for talking about Project Life. I have a HUGE craft room filled with scrapbooking Paraphernalia. It's probably more embarassing that your photo collection. Anyway, I keep thinking I'm going to sit down and really get to putting all my photos into beautiful albums and now my girls have graduated college and started families. And still no kindergarten pictures in albums. Bummer! But I do keep looking at Project Life and wonder if I start now maybe I could have an album put together before I leave this earth. HA! Anywhoo...just wondering if you use any special photo camera on your phone or just the simple camera that came loaded. I've heard there are different downloads available. Also, how do you get your pictures off your phone and into an actual photo that you can hold in your hand? Sorry, long comment and question here. But inquiring minds do want to know. Hi ya girly! This is great. I have a semi-kit, that I've started with some of my own stash and I keep putting it off. Gotta get in there and find my groove again! How fun...I LOVE this idea!!!!!! Thanks for sharing..can't wait for Monday! Ooh this gets me excited! I used to scrapbook all the time, but it just became overwhelming to keep up with the amount of photos I take on instagram. This might be right up my alley! I had no idea you were a project lifer, too! How did I miss that? I started the digital version for 2013. It rocks, so much easier for me to not have all of the "stuff" that goes along with traditional paper scrapping. I've just started using Project Life and love how simple it is to create a great looking book. Any idea what time? Ive been dying over one of these for over a year but have always talked myself out of it because of the price. I have 4 little boys so I'm crushing on the Jade one! I love Project Life but use the digital products and create my pages in Photoshop. It's such a great product! I especially love their baby kits! I just wanted to tell you thank you!! Thanks to you & your blog you have inspired me to wear lipstick. I know that seems so silly, but it's something I always WANTED to do, but never felt like I could. I felt like I looked silly wearing it. I wore it on Halloween last year & LOVED it, but was afraid ppl were laughing so I didn't wear it again. Now I am please to say, I have SIX tubes in different colors that I adore. I wear it all the time & I feel so great about it. baby steps. :) thanks so much for the inspiration. Thanks for the heads up on the sale! I have been thinking about PL for awhile now and this may just be the right time to start. Woo-hoo! Any idea what time this segment will be airing? Hopefully evening! I am so glad you did this post. I have 2 project life books that are ready to be filled. I have a question for you. I want to use my instagram pics in my project life. They print square, so, how would you use that in project life sheet protectors? This would be perfect for me!!! I am trying to be better about capturing things on instagram. @lindsay--We R Memory Keepers has page protectors, too, perfect for Project Life including a 9 slot 12x12 one for 4x4 photos/instagrams. Becky has all sorts of configurations of pages, several with slots for 4x4 pics. L♥VE what you have done with the kit. What an inspiration! Thanks for sharing!! !